Milk quality, mastitis and udder health researchers, dairy producers and dairy industry partners gathered for the 57thNational Mastitis Council (NMC) Annual Meeting, held Jan. 30-Feb. 2, in Tucson, Ariz. The 380 attendees, representing 21 countries, learned about the Five-Point Mastitis Control Plan – its past, present and future strategies and applications. 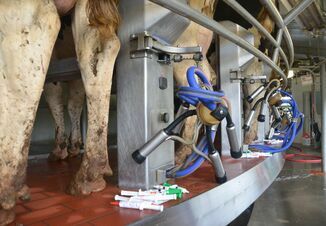 NMC’s five points include: post-milking teat disinfection, comprehensive dry cow therapy, therapy of clinical cases during lactation, proper milking machine maintenance and culling problem cows. In the National Dairy Quality Awards program, NMC honored six dairy operations as Platinum winners. These top quality milk producers included: Bailey's Cherry Valley Dairy LLC (Mike, Jean, Brent, Brock and Nelda Bailey), Tomah, Wis.; Country Aire Farms (Tom and Mike Gerrits), Kaukauna, Wis.; Butterwerth Dairy Farm LLC (Larry, Paulette, Jeremy and Paul Werth ), Alpena, Mich.; Tollgate Holsteins (Jim and Karen Davenport), Ancramdale, N.Y.; Folts Farms LLC (Joshua and Virginia Folts), North Collins, N.Y.; and SunRidge Dairy (Mike Siegersma and Adrian and Ryan Kroes), Nampa, Idaho. Judges selected outstanding dairies to receive this honor based on quality milk production indicators, such as somatic cell count and bacteria count, along with milking routine, systems of monitoring udder health, treatment protocols and strategies for overall herd health and welfare.